Currently Burton Contractors alongside Roads and Maritime Services (RMS) are completing massive road works at Kelso on the Great Western Highway. The team at Kelso value the importance of community consultation and make it the forefront responsibility in their daily operations. A fine example of this relationship has been the reopening of the Kelso Fruit Market – Amy Bromhead Kelso’s Community Relations Liaison, with Bathurst MP Paul Toole paid a visit to one of the owners, Jason Browne, to check out the renovations and see how business was travelling since the doors reopened. 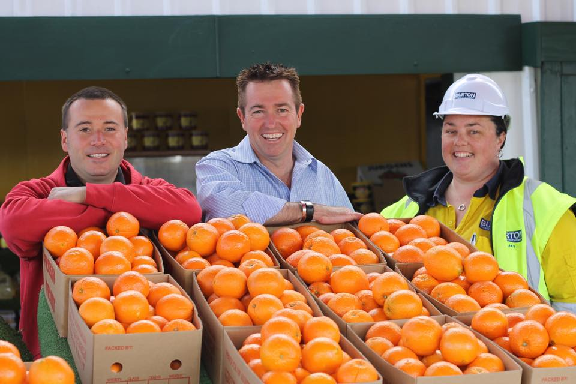 Jason Browne fruit shop owner, Paul Toole Bathurst MP and Amy Bromhead Community Relations Liaison.